The Supreme Court has granted six weeks’ time to the Ministry of Women and Child Development to take a final call on the issue of engaging trained personnel in the creche in the Supreme Court premises while also asking the Registry to consider the possibility of designating members of the staff who are trained in giving basic lessons to children aged three to six years, in case the staff is outsourced. The court also proposed securing finances from independent sources for upkeep and maintenance of the creche which became functional on the apex court premises on May 1 following a PIL by advocate Anindita Pujari and argued by Indira Jaising. 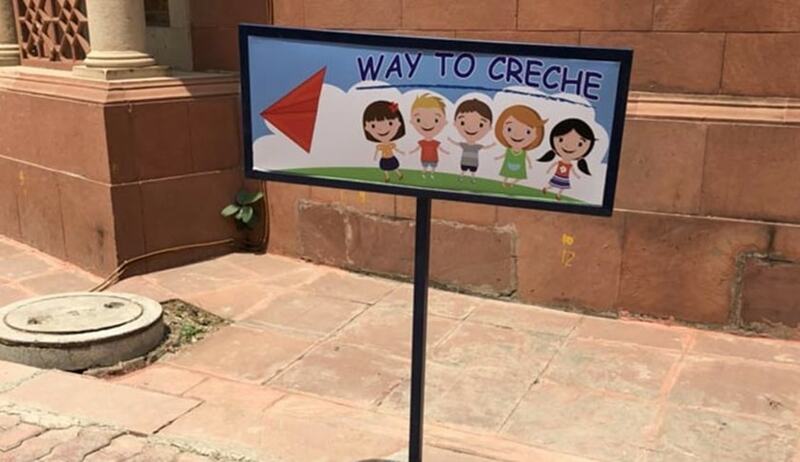 “We grant the Ministry of Women and Child Development six weeks further time to finalize the issue with regard to provision for placing the services of trained personnel in the creche in the Supreme Court premises,” ordered Justice Ranjan Gogoi, Justice R Banumathi, and Justice Navin Sinha. The court, while impleading the ministry, also took on record a report submitted by the Secretary-General of the Supreme Court wherein it was stated that the matter pertaining to outsourcing of the staff of the creche (partly) is being mulled by the Ministry of Women and Child Development and it has by a letter dated July 6 sought more time to finalize the issue. Meanwhile, the court asked senior counsel Sidharth Luthra, appearing for the Registry, to take up “with the Ministry whether it will be possible for the Ministry to designate one or two member(s) of the Staff, if out-sourcing is to be provided, who are trained in giving basic lessons to some of the children who are using the Creche after school hours (age group of 3 to 6 years)”. He has also been told to interact with all stakeholders regarding the possibility of securing finances from independent sources for the upkeep and maintenance of the creche and for procurement of infrastructure in the future.